Donkeys and saddles ready made are always forthcoming for an “Engilitz”. In a few minutes we were in sight of the temple, and use our utmost exertions to reach it. My obstinate animal has been there often enough, and now runs into a cornfield, where I leave him and trust to my own legs. . . . On a flat plain of beautiful verdure rises a small dark mound, covered with ruins, in the centre of which appears the celebrated temple of Dendera. On nearer approach, the surrounding fragments, which had given the principal features of the picturesque, vanish into the mud walls of an Arab village. 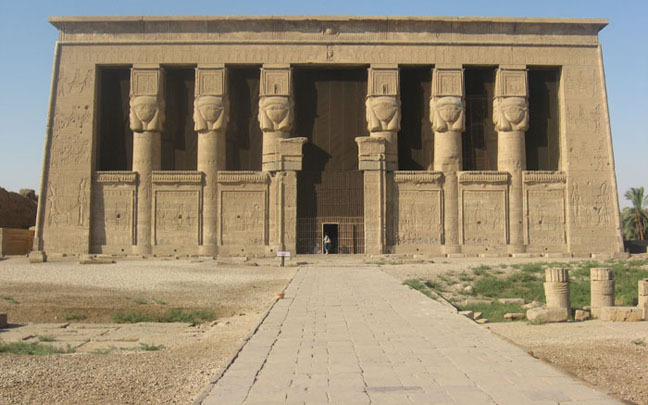 Dendera has been so often described in the large square books, that to repeat what has already been said would be wearisome to us both . . . arrived at the Portico; I am lost in admiration, even though the concomitant filthy hill is nearly on a level to the top of the portal . . . the peculiar and characteristic beauties of Egyptian architecture are here in full perfection. The French archaeologist Maspero approached the temple in the early evening, meeting the sugarcane reapers returning from their labor. The great Champollion visited at night.